Addicted and can’t stop playing Pokémon Go? Or getting bored with the game? Or haven’t been playing Pokémon Go for a while? If you don’t want to play Pokemon Go game anymore, it’s time to delete your Pokemon Go, or more accurately, Pokémon Trainer Club account. Here’s how to delete the Pokémon Trainer Club or Pokemon Go account. There is no built-in in-app option to delete the Pokemon Go account within the Pokemon Go game. In the game’s settings, you can only sign out from your account. Enter the Trainer nickname of the account (not account user name), email address and tick the check boxes marked with red asterisk to confirm that you understand the consequences of deleting the Pokemon Trainer Club account. Deletion of Pokémon GO profile is IRREVERSIBLE, and you CANNOT reuse the email address or nickname even after the account is deleted. Once you’re ready (to delete the Pokemon Go account forever), verify the captcha and hit Submit button. 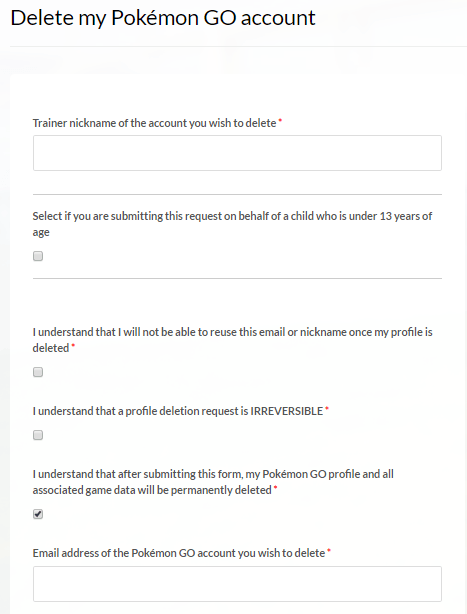 After that, check your email address and follow the instruction in the email sent by Pokemon Trainer Club’s customer service to confirm the deletion request to completely and permanently delete all game data associated with your account. You may need to wait for up to a few weeks for the account to be deleted. However, you can already delete the Pokemon Go game from the iOS or Android device.